FURIOUS FEET ROCKING THE CONCRETE. 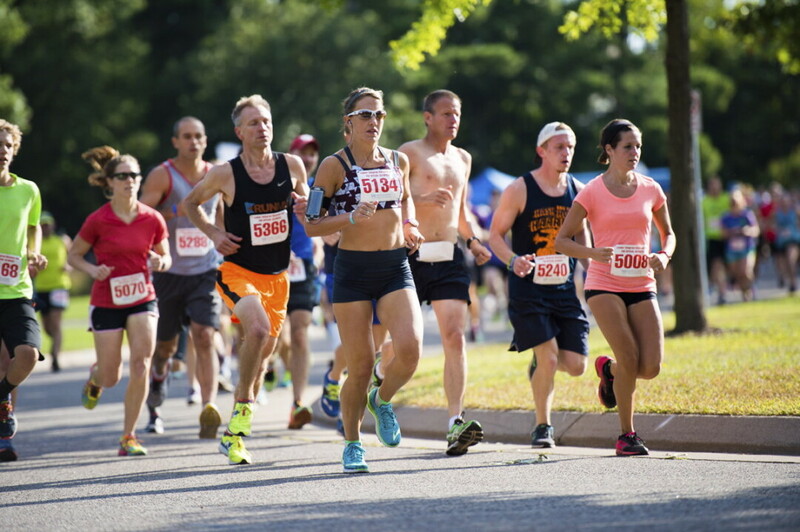 Runners participate in the 2016 Buckshot Run in Eau Claire’s Carson Park. This year marks the 35th anniversary of the Buckshot Run – an event that originated in the Chippewa Valley, is exclusive to the Chippewa Valley, and is named after a Chippewa Valley notable. The anniversary is cause for special celebration – including cake! – but the focus of the run (held in Carson Park on Aug. 29 and Sept. 2) remains on supporting Special Olympics in and around the Valley. “In 1982 Ron Buckli, a sports writer for the Leader-Telegram, pitched the idea of holding a running race in Eau Claire to raise money for Special Olympics Wisconsin,” Kraus explained. Bob Lesniewski, the Special Olympics’ area director at the time, embraced the idea, and the run was born. For those who have attended or participate in previous years, they will recognize the “Originals,” a group of men who have run the event every year for the past 35 years (and generally don their shirts from the first race for the event), and will also get to enjoy cake in celebration of the 35th anniversary of the event. Kraus noted that it is no surprise the Buckshot Run, an event exclusive to the Chippewa Valley, has been successful for the past 35 years; she said support for Special Olympics from the Chippewa Valley has been amazing, and that there is always room for more for those looking to give their time or money to Special Olympics. One may be surprised to learn about how many local athletes benefit from this support. “In the 18 counties my region covers there are more than 1,000 athletes, most of whom live in the Chippewa Valley,” Kraus said. “Special Olympics statewide serves 10,000 athletes. Our program offers 18 sports and participation is year-round. To learn more about the event, or how you can get involved with Special Olympics Wisconsin, visit specialolympicswisconsin.org/events/buckshot-run.